The Austin Cooperative Business Association is dedicated to growing and strengthening the Austin-area cooperative community. Members represent 20 houses and over 800 residents. Housing cooperatives provide affordable residential solutions based on shared ownership, community stewardship, and mutual aid. Two major Austin consumer co-ops, Wheatsville Food Co-op and Black Star Co-op, total over 23,000 members. These co-ops are devoted to high quality, local, sustainable food and cuisine. 4th Tap Brewing Co-op, Earthbound Builders Collective, Polycot Associates, and Treasure City Thrift are high-performing businesses democratically owned and managed by their employees. . This map shows ACBA Coop members (purple), ACBA Associate members (green) and Central Texas credit unions (yellow). You can access the layer panel by clicking the button in the top left next to "Central Texas Cooperative Economy." 4th Tap Brewing Cooperative was born out of a shared passion for brewing delicious, interesting, and refreshing beers. Beer is meant to be shared, and we've been sharing our beer since the first batch was homebrewed on a stove-top over 10 years ago. 4th Tap is the first worker-owned cooperatively-governed production brewery in Texas, and one of the first in the United States. 4th Tap is 100% owned by the people who work on the floor day-in and day-out. We believe that having a stake in the success and failings of our brewery make our people happier and our beer taste better. We are family, a big family, and our brewery is home. Stop by for a beer! Black Star Co-op is the world’s first cooperatively-owned and worker self-managed brewpub. We are owned by a community of more than 3,000 individuals and organizations, and we're democratically managed by our Workers' Assembly. Co-operatives are businesses owned by the people that purchase or manage its services. You don’t have to be a member-owner to come to the brewpub, but supporting Black Star Co-op means supporting livable wages, democratic workplaces, local farms, and quality products from your community brewpub! College Houses is a registered 501c3 nonprofit that is cooperatively managed by our student members. Each of our seven west campus co-ops is maintained by its members – we do everything from maintenance to cooking meals (17/week included). Every week, houses hold meetings to discuss policies and plan for the future. Self-governance means`we elect officers to coordinate and manage most day-to-day operations. Not only does this provide excellent opportunities for education and personal growth, it also keeps our costs down tremendously. And, because we’re a non-profit, those savings are passed directly to you. Community Housing Expansion of Austin, CHEA is a non-profit, 501(c)(3), cooperatively-owned housing organization in Austin, TX. Our two houses are Sasona and La Reunion. Community Housing Expansion of Austin creates and sustains affordable cooperative housing communities. Cornerstone Credit Union League is committed to protecting its more than 550 member credit unions while promoting their growth, strength, and unity. Cornerstone is positioned to deliver upon the industry’s current and future needs by providing and investing in essential services and resources. In order to shape the credit union operating environment and strengthen institutions throughout the country, credit union leaders are looking for real value in League membership, value that comes with large, robust, and relevant organizations with a full suite of products and services. Earthbound is a worker-owned collective of builders based in Austin, Texas. We aim to provide high quality, environmentally responsible construction services. We focus on using natural building methods, local materials, and sustainable design principles to create spaces that are healthier to live in, more beautiful to look at, and better performing than conventional alternatives. We are committed to collaborating with our clients to create one of a kind solutions. Let us help you realize your natural building dreams! KOOP (pronounced koh-op) is a community radio station in Austin, TX, owned and operated by its members in a cooperative structure depending primarily upon its volunteers and supporters for all operations of the station. KOOP provides a diverse array of programming, emphasizing programs that deal with local issues and/or serve communities which are under-served by the mainstream media. The purpose of ICC Austin is to create a mutually beneficial, diverse and inclusive community so as to promote the transformation of society towards cooperation, justice and non-exploitation. To achieve this vision, ICC Austin provides affordable housing to students, on a cooperative basis, in an environment that enhances member education, encourages the formation of long lasting communities, and foster responsible citizenship. Polycot Associates is a mission-driven, employee-owned cooperative business offering web consulting and managed web development/design services. Our preferred clients are other mission driven organizations, including nonprofits, other co-ops, green and sustainable organizations and businesses, and B-corporations. 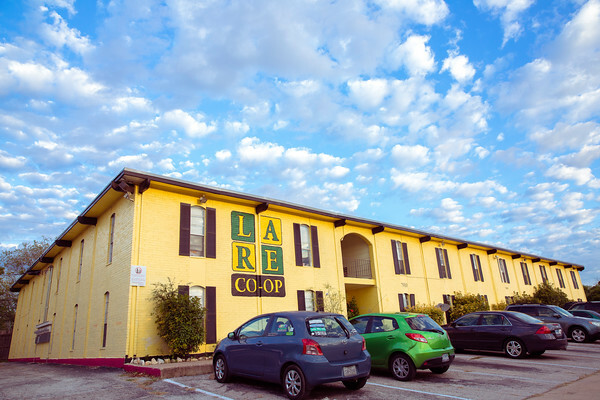 The Texas Rural Cooperative Center exists to improve the economic conditions of rural Texas by assisting with the start-up, expansion, and operational improvement of rural businesses, especially cooperatives and mutually-owned businesses. Treasure City Thrift, a worker-run nonprofit, supports local groups working for grassroots change.We provide material, financial, and promotional support to groups working for grassroots change, helping them to become more sustainable and continue their work in our communities. We transform waste into resources that benefit our communities; we link economic and environmental sustainability. We support local communities in our East Austin neighborhood, many of whom are historically marginalized and neglected, by providing community space, educational resources, and inspiration, and by making local and donated goods available and affordable to all. We are a radical economic experiment based on a collective model, using consensus decision making. There are no bosses here! Vulk Coop is a worker-owned, full stack development consultancy based in Austin, TX. Vulk offers a full range of software development services, including design, user interaction/user experience, agile project management, frontend/backend/API development, and infrastructure scaling. Contributing to the open source community, mentoring freelance newcomers, and supporting the co-operative movement are just a few of Vulk’s core values. Vulk Coop has hosted the Austin Software Co-operatives monthly meetup since 2015. WHEATSVILLE FOOD CO-OP is a full service, natural foods cooperative grocery store, which has been serving the central Austin community since 1976. Wheatsville is the only retail food cooperative in Texas and has over 20,000 invested owners. Invested owners participate democratically and financially in the co-op. In 2013, we were proud to have realized our dream of opening a second store. The purpose of Wheatsville Co-op is to create a self-reliant, self-empowering community of people that will grow and promote a transformation of society toward cooperation, justice, and non-exploitation. The mission of Wheatsville Co-op is to serve a broad range of people by providing them goods and services, using efficient methods that avoid manipulation of the consumers, and minimize exploitation of the producers or damage to the environment. The primary focus for this mission is supplying high-quality food and non-doctrinaire information about food to people in Austin, Texas. Yard to market co-op, founded in 2013, is a cooperative business, owned by and serving the needs of independent, home-scale food producers. By combining resources, we are able to access the local food market and reduce marketing, sales and distribution costs for all owners, thus improving the economic benefit of home-based food production.